Strong deep-value investment found from targeting Brazil's key non-cyclical consumer sector benefiting from rising real wages, projected 2x current GDP growth, increased employment, and a new business-friendly regime under Bolsonaro. Brazilian retail food play targeted through changing Brazilian consumer preferences and new management brought in from a successful turn-around venture introducing the same cost-cutting and profit enhancing expertise. Consistent CF, low-risk debt structure, unrivaled sector growth potential, and high CAGR prospects with a margin of safety bring CBD's projected price outlook to a conservative 1-year target of $26.79 (+14% upside). Imagine a situation where the macroeconomic picture presents a clear upside; you've identified the sector that has historically realized the most consistent upside with little downside volatility; you've analyzed every investable ADR to get this desired exposure; and you've located a consistent value-oriented company aiming for expansion, but not presently stunted by typical high EM debt loads and inconsistent CF. This is the company I will present to you. After conducting a thorough global analysis of macroeconomic and political changes and that may provide strong 2019 growth with a wide margin of safety, I've concluded that Brazil's consumer sector stands to benefit the most in 2019 with a variety of unique business lines. Under the new 2019 president, Jair Bolsonaro, the right macroeconomic and business-friendly environment have emerged. 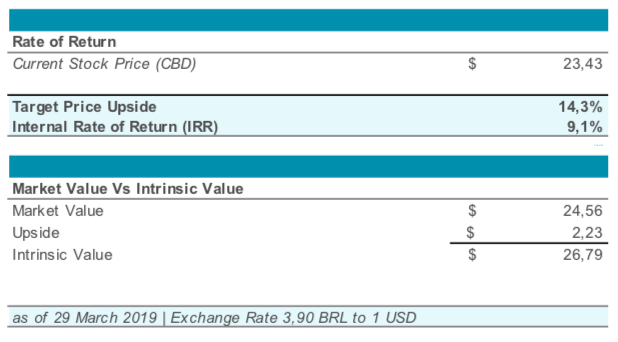 Contrary to the consistent global rate hikes and the looming recessionary pressures we are seeing, Brazil stands to be the next equity market with significant upside and a low interconnection with the US market [Beta: 0.21 | (EWZ):GSPC]. Companhia Brasileira de Distribuição (CBD) is a powerhouse dominating the retail sales market in Brazil employing more than 100,000 individuals with post-recessionary 2018 sales growth of 10.7% and net income more than doubling y/y. The company is involved in a variety of synergistic business lines including their primary segment in the retail of food and several other segments including home appliances, clothing, electronics, and more. 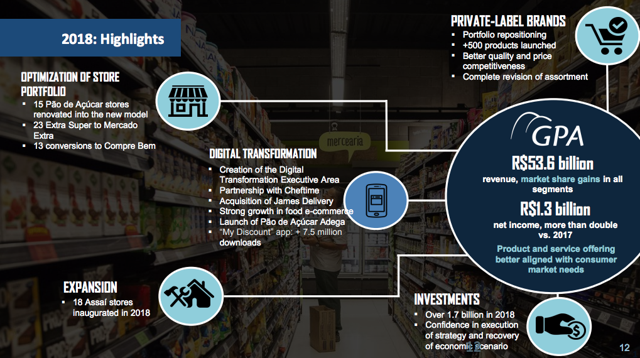 The company operates a uniquely strategic chain of hypermarkets, supermarkets, and specialized stores that access a variety of consumers from the youthful and technology-friendly to the wholesale desiring cost-sensitive. The company's headquarters are located in São Paulo, Brazil and the investment I am presenting is their NYSE ADR (CBD). Why CBD & Why Now? The time may not have been right 7-months ago with the political uncertainty surrounding who will succeed to Brazil's presidency and if the recessionary pressures have truly subsided. This opaque situation is now a clear alignment for an investment with a margin of safety. The strength of CBD's operational efficiencies alone creates a strong risk-to-reward dynamic. Even if the macroeconomic consensus is not hit, CBD still has both revenue growth and margin improvement potential. With CBD's new modern e-commerce focused management, we are seeing a variety of profit inducing catalysts upcoming. CBD is also in the second stage of implementing a successful profit enhancing store-conversion strategy that has growth potential written all over it. The macro picture that I will explain adds merely to the margin of safety that is required for the conservative investor. I will outline the operational catalysts in more detail under the cash flow analysis section. Now when considering CBD's potential macroeconomic catalysts, we must consider the broad environment. Not only does the business-friendly regime that succeeded to the Presidency in 2019 present positive prospects, but Brazil has finally exited the recession posting positive GDP growth in 2018 of 1.2% and forecasts for 2019 of 2.2% and for 2020 of 2.4%, nearly doubling 2018 GDP growth. We all understand Brazil's economy will grow, but you may wonder about stock prices given the seasonality and compression of Brazil's markets in April to July. In my methodology, the stock needs to be purchased at a low valuation to realize significant gains and no one can foretell the future perfectly. With consistency, we do see the April-July IBOVESPA compression of prices, which should be monitored if fearful of the position's downside, but it should not deter you from getting in. If you aren't for the deep-value opportunity, then it may be best to take this position after July, but you may miss the short-side effects. My position will be hedged for systematic risk, but you may make your decisions. In all my reports, I aim to present a comprehensive, but succinct analysis; however, I am thorough which may make the analysis longer than typical. The structure will be as follows:  Stock Price Introduction,  Macroeconomic Analysis,  Industry/Sector Analysis,  Cash Flow Analysis,  Balance Sheet and Debt Management Analysis,  Strategy Analysis,  Valuation,  Comparable Companies Analysis, and  Conclusion. In analyzing the stock price history, I made sure to research various historical environments from rate rising periods to the macroeconmic figures of real wages, sector growth, employment,...etc. Mapping CBD's stock price patterns to macroeconomic changes allowed me to quickly understand which figures had seemingly more influence on stock price changes and could be researched further. It also presented which figures only theoretically had a JND effect. I noticed a strong correlation between the macroeconomic factor dynamics explained below and the larger trend CBD moved in during that time period. My research is typical of a fundamental nature; however, I made these stock price comparisons to further ensure my research was not simply theoretically-biased when compared to real stock gains. This leads into the macroeconomic projections below that I expect to be a strong catalyst for the returns in 2019 and onward. As you can see from the graphic above, the macroeconomic indicators are pushing toward a growth-inducing environment, with GDP growth forecasted to nearly double in 2019 and increase another 39% in 2020, on a conservative estimate. As far as access to capital, the CB of Brazil has drastically dropped the SELIC rate, Brazil's overnight rate, from the annual 10% average in 2017 to an average of 6.5% in 2018, with results from the 2019 March meeting holding the key rate at a low 6.5%. The currency expectations are also expected to favor 2019 for foreign $-denominated investors with the expected R$/D$ exchange rate coming down even more from the start of the year at R$ 3.88 to R$ 3.70 [+4.8% to your $-value EPS]. An important theme in selecting the consumer non-cyclical industry is from an integrated analysis: spending habits of Brazilian consumers during real-wage increases; connecting growth prospects in varying industries affected by projected inexpensive financing; considering country-specific macro growth pressured by seemingly deep-in-the-cycle global slowing concerns; and a required margin of safety against industries deemed high risk based on Bolsonaro's policies. Due diligence into the consumer spending habits offered many concerns and risks that I considered. Some of which were presented by McKinsey's recent surveys of the Brazilian consumer, and some of which were done analyzing data from the Brazilian statistical agencies like the IBGE, banking institutions, and others that when combined through an averaging key-theme top-down approach, presents the historical and projected typical Brazilian consumer in Brazil's major cities. One of the information pieces was concerning the Brazilian middle-class and upper-class spending habits. Summarised it presents Brazilian consumers as moving into higher quality goods [e.g. premium groceries], but still holding brand-loyalty [e.g. low-cost grocers] as they transition out of the recessionary spending habits. Others emphasized a tendency for these consumers to over-spend and utilize debt which under the Bolsonaro regime should become more widely available. I feel that considering the options of ADRs, CBD seemed to be a clear beneficiary of this style of changing consumer economics as well as of the safety that consumer industries present with considerations for global slowing. The macroeconomic situation we are experiencing now is differentiated than historical periods as factors do change, but the same industries are prone to the same global cyclical and macro-oriented connections that are basic to the economics of Brazil and to how the Bovespa operates. 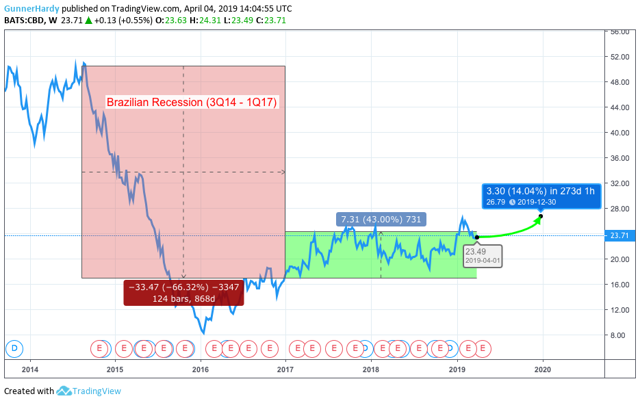 We do see outperformance of the Brazilian Basic Materials index [red line] in the above graph, but this is based on a cyclical global growth effect that I do not deem to have an optimistic risk-to-reward ratio with current valuations going forward. Brazilian Financials [green line] operates well in the current market conditions, but going forward this has more downside risk exposure given it's unwanted overweight exposure to macroeconomic conditions of the country as a whole. The ADR list also showed that at a sector level ABEV would be an interesting choice, but deeper consumer research showed their products are losing favor with newer Brazilian consumers. These consumers are not favoring carbonated beverages and are highly susceptible to trade-ups where ABEV's revenue would be adversely affected. Seeing their recent quarterly results, they are a high-risk play not able to cleanly utilize the upside catalysts. CBD has fewer risk factors and stronger individual company prospects. I will outline these further in this report. After translating and pouring over countless McKinsey research reports, Brazilian consumer statistics, news articles, and Brazilian consumer profiling research, CBD is the best able to run this equity surge and maintain price potential for the short to medium-term regardless of adverse macroeconomic changes. After presenting the below analysis on the company's strategic position and strong financials, I am positive you'll see the value in this investment. Although the 2014-2017 Brazil recession hurt the consistency factor for CBD's operating results, it presented a unique side to this robust company able to withstand one of Brazil's longest recessions. It is important to note that in 2018 the financial statements were drastically altered for the 2019 disposal of the Via Varejo subsidiary. It is important to analyze both financial statements so we can fully understand how the company operates under varying circumstances. Even after considering the 2015 and 2016 economic contractions of -3.55%, and -3.31% respectively in GDP terms and with unemployment drastically rising from 1Q15 at 7.9% to 13.7% of the population unemployed in 1Q2017, CBD managed to only post 1 negative growth year in the last 5-years, before and after adjusting for the disposal of their subsidiary. This loss occurred in 2016 during one of brazils largest contractions and unemployment increases. This was a strong-one off situation, but it did show CBD's great flexibility in operations. 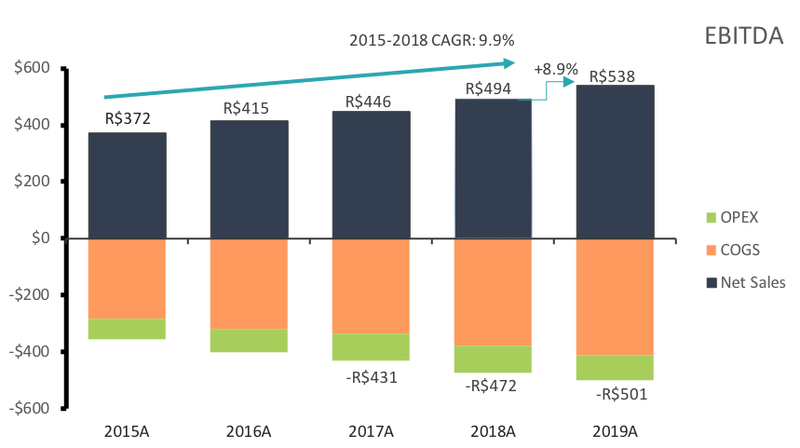 CBD quickly adjusted for these changing consumer circumstances bringing revenue growth back to +7% in 2017 and then +10% growth in 2018 after finalizing the 2019 sale of their subsidiary Via Varejo, which has been up for sale since 2016. They attained these strong numbers by targeting the low-cost consumer during recessionary pressures and then following consumer patterns to time the introduction of their conversion strategy, a model for converting store profiles for different consumers [still being implemented now]. This flexibility allowed them to also maintain their margins during the Brazilian recession with their lowest 2016 -40% revenue loss resulting in a gross margin only deteriorating a half percentage point from FYE15: 23.53% to FYE 2016: 22.97%. Returning strongly in 2018, CBD quickly exceeded even their FYE15 numbers with a current gross margin of 23.98%. We expect these operational results to continue. Revenue numbers will improve organically through rising wages, increased employment, economic security and thereby increased consumer expenditures. On a strategy level, CBD has been expanding it's highly lucrative cash and carry segment, Assai, and converting their Extra Super stores into Mercado Extra and Compre Bem stores. This strategy implementation has realized strong post-conversion growth of approximately +30% at Mercado Extra and +50% at Compre Bem. This is mainly due to productivity increases and the strategy's aim at improving customer service connections and providing services tailored to regional needs. The first wave of conversions in 2018 showed high double-digit growth results and the second wave of conversions is expected to take place in 2019. This tailored expansion and it's accompanying cost-cutting consolidation benefits should increase the earnings available to investors and thereby provide a catalyst towards increased stock returns for shareholders. As far as the balance sheet, we see strong improvements towards moderation and risk reduction with no significant risk factors. In our liquid asset arena, FYE18 showed a +15% improvement in the company's cash position to R$ 4,369M. We do see excessive increases in other current liabilities, but by reading into the FYE18 financials we understand that it is related to assets and liabilities being transitioned into the sale from Via Varejo and it is accompanied by a greater CA increase. No risk is present in this transaction as it should be positively cash enhancing when undertaken later this year. We do see a seemingly large AP, but this is related to the retail industry and is growing in line with revenue growth. In addition, long-term debt did pick up 9.9% but is manageable and below revenue growth with its usage providing significant value-added. In addition, the interest expense is still manageable at R$ 705M and it has not increased beyond FYE16 levels. I find this debt necessary for the expenditures and transitions of the conversion strategy mentioned above. As far as a comparison to a global peer set*, we are seeing average to better-than-average results for CBD. CBD has a great quick ratio for FYE18 at 0.93x as compared to the peer average 0.38x. We see a strong current ratio of 1.11x as compared to the peer average of 1.01x. Finally, we see a great debt-to-equity ratio of 0.32x as compared to CBD's peer average of 0.86x. *More details on the peer group can be found below in the Valuation section. The end of 2018 displayed a shake-up of traditional key management positions. I believe the changes will be value enhancing. The new CEO is Peter Esterman who previously served as the CEO for Via Varejo, the subsidiary that has been on sale since 2016 and has improved remarkably. Peter Esterman took a previously unprofitable infrastructure heavy retail company and transformed it into a lean and profitable e-commerce targeting chain. His specialty is displayed as working on transformations from heavy-infrastructure based organizations to modern e-commerce integrated light-retail. This primarily affects margins and profitability which should greatly improve under Peter Esterman while boosting growth through technological implementation. The previous CEO is still on the board and collaboration on the transition into the e-commerce sphere is a shared objective between the two. There seems to be seamless co-integration between the various subsidiaries and parent companies allowing for the transition of skilled leaders into more influential roles. Esterman is a modern technological strategist by design and should be able to make the necessary improvements in 2019. This model provides an important presentation on the potential upside for CBD if operational expectations are met. 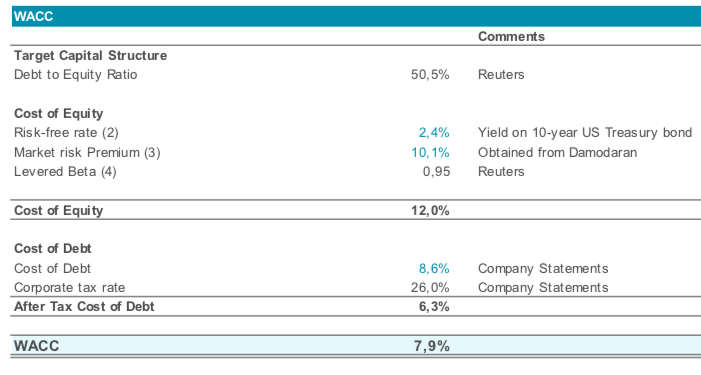 In summary, it presents a +14.3% upside to a price point of $ 26.79. It is my belief that by FYE2019 this price should be realized upon initial confirmations and growth presentations. There also exists the likely-potential for the outperformance of this figure as it is deemed conservative. I have clearly presented my inputs and it is up to your discretion whether or not you agree they are likely and or conservative. The compilation of 2017 and 2018 input numbers and operating figures come directly from the financial statements of Cia Brasileira de Distribuicao FYE18. In comparison to a targeted set of global peers, CBD is presented as a slightly more expensive company with a PE of 21x compared to CBD's peer average of 15x. But, when comparing the B/S figures, we have a strong low-risk company that is worth the expense. We must also consider the positive demographic catalysts in Brazil that make this company worth the excess expense on a peer basis. In conclusion, CBD presents a clear short to medium-term value opportunity. This is evident by its strong balance sheet with clearly positive FCF figures including impressive same-store sales growth and a strategic management change. The new management's track record is strong and will reposition CBD to benefit from the growing online-sales segment and customer connectedness of the modern age. The economic and demographic changes taking place in Brazil will be one of the biggest catalysts based on rising real wages, increasing employment, controlled inflation, broad-based economic recovery, and a private sector friendly political regime in place. Overall though, regardless of the macroeconomic situation, CBD's operational excellence under a variety of economic environments provides a strong margin of safety and a forgiving risk-to-reward ratio. As I finish this report, I'd like to leave the reader with a final quote sent to me from an important mentor of mine, "you can win 3 coins but you can only lose 1 coin with equal probabilities." CBD my recommendation for a short to medium-term value investment. CBD's current one-year price target is $26,79. For curiosity purposes, if this report has driven you to take a position in CBD, please let me know below or via email Gunner.Hardy@gmail.com. CBD has increased the percentage of persons with disabilities on their team to >21%. CBD has launched a gender equality based program known as the Manifesto of Senior Male Leaders for Gender Equality and 2 other Affinity groups targeting Racial and LGBTI+ Equality. Disclosure: I am/we are long CBD. I wrote this article myself, and it expresses my own opinions. I am not receiving compensation for it (other than from Seeking Alpha). I have no business relationship with any company whose stock is mentioned in this article.